This vegetable dish is a simple to cook bamboo shoots with coconut cream. Buying fresh and good quality bamboo shoots is bit tricky because you usually don’t know how it is prepared commercially when sold in supermarkets or wet markets. If not properly prepared, they will have a foul odor. Some vendors just put them in dirty tin cans which contaminates the bamboo shoots. Aside from that, you also have to know if those are really young and tender shoots because some vendors sell them even though they are very tough, it’s like you are eating wood shavings. And about the coconut cream, the method in the recipe below is that traditional way of extracting cream but you can use canned coconut cream. 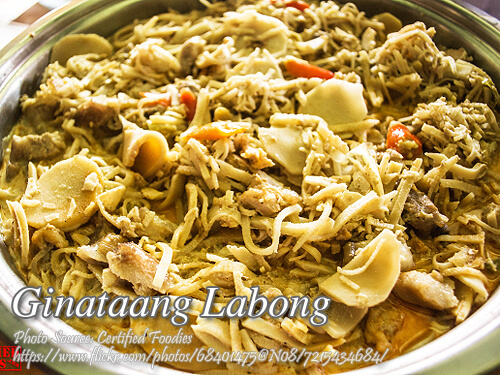 To cook ginataang labong; Soak labong in water for one hour. Drain. Squeeze out the water and set aside. Extract the milk by squeezing the grated coconut on a sieve or cheese cloth and pour it into a bowl. Set aside. Make a second extraction by pouring 2 cups of water on the grated coconut and extract directly on the pan or pot. Then add ginger, garlic, onion, pork, shrimps, pepper and seasoning. Bring to a boil while stirring gently. After 3 minutes of boiling, add the bamboo shoots. Cover and simmer for about 10 minutes. Then add the thick coconut cream, simmer until bamboo shoots is done and the sauce is thick. Soak labong in water for one hour. Drain. Squeeze out the water and set aside. Add a cup of lukewarm water to the grated coconut, squeeze with your hands and fingers until the coconut milk comes out from the grated coconut. Extract the milk by squeezing the grated coconut on a sieve or cheese cloth and pour it into a bowl. Set aside. Make a second extraction by pouring 2 cups of water on the grated coconut and squeeze again and strain the grated coconut using a cheese cloth and squeeze directly on the pan or pot. Then add ginger, garlic, onion, pork, shrimps, pepper and seasoning. Bring to a boil while stirring gently. After 3 minutes of boiling, add the bamboo shoots. Cover and simmer for about 10 minutes. Then add the thick coconut cream, simmer until bamboo shoots is done and the sauce is thick. Add the green finger chili 2 minutes before the cooking is done. You can also mince the chilies if you want the dish hot and spicy.